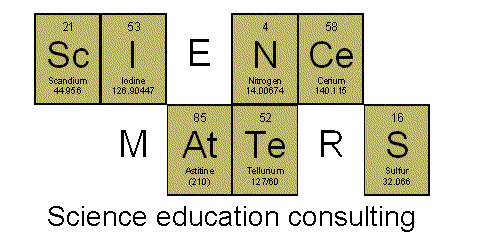 Science Matters: Heat Transfer: How Does it Feel? A basic tenet of the study of thermodynamics (that's right, I said thermodynamics. It's a big scary word, but really it just means anything having to do with the transfer of heat. Of course, there's a whole lot more about it - you can spend semesters studying thermodynamics, but there's nothing wrong with calling your study of heat transfer thermodynamics. In fact it'll make everyone involved feel that much more important) is that heat/energy flows from higher temperatures to lower temperatures. Here's a way you can actually feel that principle at work. --Fill one bowl with water and allow it to sit for about 5 minutes (or more) to reach room temperature. 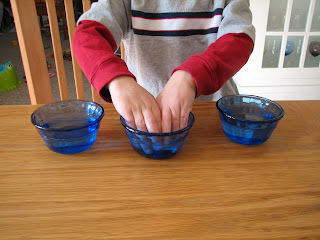 --Fill the next bowl with water and add several ice cubes. Stir. --Fill the final bowl with warm tap water. Aim for something that just feels warm on your wrist - you don't water so hot that it'll hurt you. 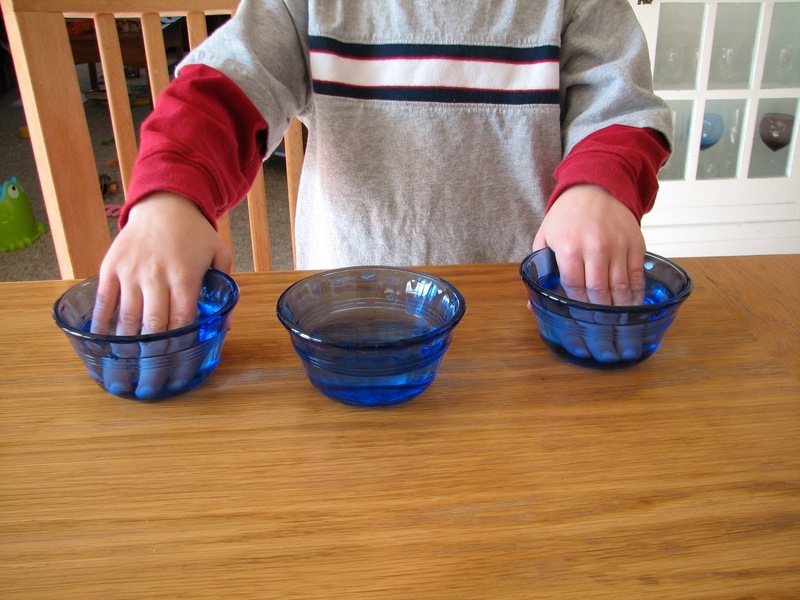 Arrange the bowls on the table so that the room temperature water is in the middle and the hot and cold water are on either side of it. Place one hand in the warm water and the other hand in the cold water. Leave them there for about 20 seconds. Remove your hands from the bowls and place them both in the middle (room temperature) bowl. How do they feel? Even though they are now in the same water, the hand that was in the cold water feels warm and the hand that had been in the warm water feels cold. Why? You placed your hand in warm water. The energy (heat) moved from the water, which was hotter than your hand, to your hand, making it feel warm. Then you placed it in water that was colder than your (now warmed) hand. The energy (heat) left your hand and flowed into the water, leaving your hand feeling cold. You placed your other hand in cold water. The energy (heat) moved from your hand into the cold water. When you placed that hand, with a reduced amount of heat energy, in the room temperature water, energy (heat) flowed from that water to you hand because there was more energy in the water than your hand. Karen, I'm writing a book on thermodynamics for high-school students. The book is in Hebrew. While (being an Aeronautics Engineer) I know the experiment, I would like to use the two photos you published in this page. Please contact me directly and tell me how credits should be mentioned. Thank you, Ronen.